I absolutely adored Splintered. It was a wildly imaginative take on the Alice in Wonderland story and I loved Howard’s vivid imagery and characterization. Not to mention Morpheus who was totally swoony! 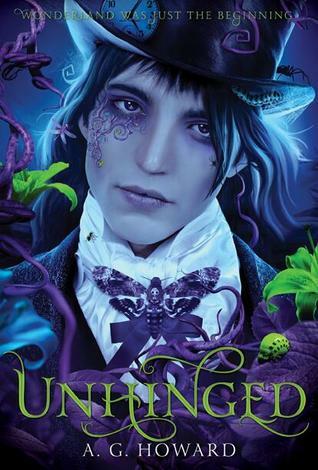 While I enjoyed the sequel, Unhinged, I did not love it as much as Splintered. For me, the setting in the human world made the story lose some of its magic. Unhinged begins a year after the events in Splintered. Jeb has graduated and Alyssa is almost finished with her senior year. Everything seems to be going well which is immediately crushed when a mysterious art collector and Morpheus come to town. Jeb and Alyssa have been together for a year now but I found myself disliking their relationship. I think they were both going through the motions of saying they love each other but that love never translated to the page. Alyssa got jealous of the art collector and felt unsure of her and Jeb’s relationship. It’s kind of a bummer too because while I prefer Morpheus I actually liked Jeb in the first book. He seemed to be exactly what Alyssa needed. While, I do believe the setting in the human world took away some of the magic that was in the first book; Morpheus in the human world was hilarious! He is by far my favorite character in the series and I would love a novella from his perspective! He is the same dark, shady, wonderlandian we’ve come to know and love! He totally stole every scene he was in. I did like that this sequel delved further in to Wonderland’s back story and the relationship between Alyssa and her mother. I was surprised by some of the revelations Alyssa has in this novel and expect even more in the third book. While the relationship between Alyssa and her mother was greatly improved I didn’t like the way Alyssa treated her father. I understand the need to hide things from him but it felt like she was treating him like a child when he’s done nothing but be supportive. Overall, I enjoyed Unhinged, just not as much as Splintered, which totally blew my mind. I have very high hopes for the third book Ensnared though. It looks like the crew will be returning to Wonderland and I can’t wait for high jinks to ensue! As soon as I saw the cover I thought it looked a heck of a lot like the Mad Hatter. Funnily enough, as I read your review I realised it actually is! I'm a bit iffy on books that have a plot similar to Alice In Wonderland because it has been done before (i.e Alice In Zombieland). Really wanting to get my hands on this one! Too bad that you didn't like Jeb and Alyssa's relationship :-( Great review! I have heard great things about both books! You have me even more eager to start the series. Too bad this one wasn't as good at Splinted.